If you have already read this article read the paragraph below in quotes. Or you can skip to the article and then read this paragraph in color and quote. “There will be a little correction in this article reg. 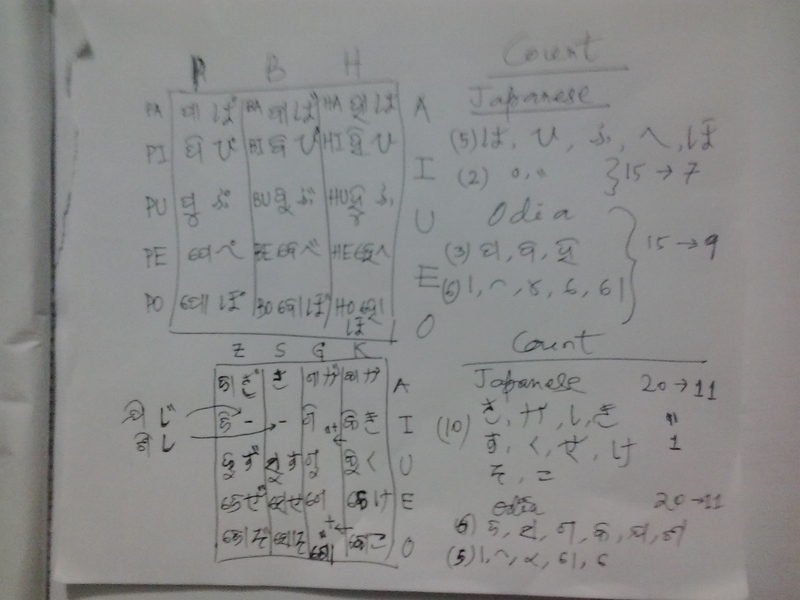 the properties of Hiragana and Indianic alphabets, given that there is some actual analysis which I will append as a hand-written chart. The ideas are still true but there is some more insight into it, which makes the understanding better and the basic fact that was mentioned in the first version are still correct: There are AT_MOST (more likely less than this) 46 character-units in Hiragana and AT-LEAST 56 ( and definitely 7 or 8 more) in the Indian alphabet system of almost all languages of India I know. eg I do not know Bengali but they certainly have the same alphabet system as Hindi/Odia, I had tried to learn Bengali alphabet as a kid and wrote my name, but forgot, its given that there is about 20-21 fold degeneracy in alphabet system of India, that is, given that the rules and methods of the underlying linguistic system is exactly same for almost all languages of India, with a very small exception, eg could be a couple letter/character among ~56, language X is say 58, language Y 56, because a new character was invented for regional supremacy without much scientfic merit, the same way Indian alphabet system did not follow the world standard concept completely and ended up having an inefficient linguistic system which implies instead of 21 alphabet systems we needed only 1. The other ineffciency comes from the fact that there is at-least 56-47=9 characters more in each of the 21 alphabets, which are called 21 languages. Why 47 and not 46? Because, perhaps the only sound that misses from Hiragana is the “a sound in terms of Indian transliteration”. The Hiragana has only aa which is written as a, but in Indian system there are a and aa sounds. In one of my articles about language I had given an exposition, with thoughtful guesses about nature of Sanskrut: this is not a search parameter for that article, nor all the articles have been tagged, categorized yet, but if you read, are interested and leave a comment I can find it for you. about how there are generators in a hypothesized language “Sanskrit” which when expanded produce the degenerated set of words which we use in current times. There [or another related article] I had described how “ga” is a heavy tone of “ka” and so on. In-fact I consider current day Japanese language far more advanced “scientifically” than current day Indianic languages although there are some aspects in Indianic languages that might be missing in Japanese. eg the a sound? in Hepburn transliteration which is for Japanese-Roman trans-versions a is used for what in India we would use for aa, thats perhaps because in terms of Indian understanding and usage the a is missing from the Japanese reservoir of linguistic objects and a is sufficient for what is used in Indian usage. In other words India has both a and aa sound but Japanese has only aa sound which they use for transliteration as “a”. atarashi=new would be in Indianic rule be written as aataaraashi. But strictly speaking its not a problem of transliteration and Indian “minds” should desist from such multiplicity in other words a could represent both a and aa, where the actual accent/pronunciation has to be recognized from its usage not from the transliteration. Thats for two reasons 1. Even if Roman is native to eg English language, multiplicities are avoided eg It’s= It is and It has, you’d = you would or you had, whose veracity is implemented from the situation not from self-transliteration as you can see 2. Indian language objects are not well studied and listed/delivered scientifically or technically as is eg case of Japanese which is like Indianic language but take any text or authentic description of teh methods you will see how powerful and methodical Japanese language has been made, which makes it really easy for any learner not just the native ones. Such rules are missing from India and there is whimsical usage and to replace that there are incorrect forced methods in various places. This is not a fault of anyone who wants to use a robust way for implementation of his language needs but a systematic approach has never been formulated in line with how languages have been systematically studied elsewhere. In India everyone behaves like a genius and expert like Sonia Gandhi said here everyone is a leader. There must be deep rules and research of why and how something should be, and its not out of blue. eg in Japanese alphabet Hiragana, there are 46 letters, which is much like Indianic alphabet where there are about 56 letters and symbols. They are almost equivalent, thats my point, eg exception being there is no “a” sound but only aa sound, but “a” sounds are inherited through a foreign-Japanese alphabet called katakana. The a sounds are actually whats called “inherent vowel” in Sancrit. When the consonant sheds the inherent vowel its written with a “halant” = written for rapid pronunciation so that there is no vowel. My point is except a few sounds and usage there should not be any difference between Indianic and Japanese written rules. Because the sounds are the same. eg “shi” sound is available exactly the same way in India and Japan. What Japanese have done is they have listed their alphabet in a beautiful way: read Hiragana character chart. Thats not the case with Indian alphabet, which is why there is overflow of characters in Indian system, there are 56 letters and symbols, which with an exception of only 1 or 2 characters/sounds the Japanese have merged and formed lesser number of characters which are more effective. First off there are no extra symbols called matra in Indianic languages waiting to be sitted on left-right-top-bottom of other letters, what a perversion ;) these matras/symbols are merely other letters and a large number of symbols have been created than is necessary. In other words an alphabet must be based on degenerated sounds/phonetics and that list should be minimized before a foreign transliteration is seek. What Hiragana does? pa/ba/ha are the same letter with the degeneracy accommodated by only a dot or 2-small-strokes. There are 3 set pa/ba/ha why look at the maths, there are only 2 extra symbols as one of the 3 does not need any symbol. 3 sets produce 15 characters as there are a combination of vowels [aa, i, u, o, e sounds and 3 letters pa/ba/ha which are in Hiragana just one letter, now they are accommodated by only 5 letters + 2 symbols, 15 >> 7, in case of India this is 15 letters + a few unnecessary symbols. [as mentioned in the chart below after closer inspection actually there is a reduction in Indianic also from 15 >> 9] That is a suave reduction in case of Japanese, I will write more exactly why. The problem with Indianic alphabet as I guessed is much deeper than what I first thought and wrote yesterday. OK here is the actual properties, There are about 15-20 symbols called matras and phalas, the vowels haven’t been reduced to 5, there are 10+1=11 vowels in India which are written through so called diacritics. [matra+phala?] There are unnecessary consonants. [most consonants are 4-fold degeneracy, eg ka, kha, ga, gha for just ka and 3 more symbols for each heavy tone. pa, pha, ba, bha and so on.] Therefore in total there are at-least 56 characters and as noted yesterday its not just from more number of consonants, its because of more consonants, more symbols and more vowels. So all the sounds pe, po, pi .. , ba, bu, bi … etc which are 15 in number are actually now represented through 5 letters and 2 symbols in Japanese Hiragana. But remarkably Hiragana has 46 [likely even less] characters out of which there are just 2 symbols compared to 20-30 symbols of India [I am saying 30 but actually it could go to 60-70, because there are half-letters which are added on the bottom of letters to produce what are called 2nd letters, this in Hiragana is accomodated simply by elongated phonetics eg oo, ou etc instead of that 2nd letter going on the bottom of first letter, thsi way the alphabet and translit is kept minimum] India can easily follow this Golden rule. Remember in Hiragana this rule is also followed for sh/za, ta/da , ka/ga. I didn’t know this until 1.5 days ago, what I knew was the degeneracy of phonetics which I had described as “heavy-tome” vs “soft-tone” as I had long ago said [a year ?] in one of the language articles, [ta, tha] and [ka, kha, ga, gha] the way they are written in India as different letters are merely heavy or sift tones, hence if you are to follow the best rules of scientific methods they are to be written as merely 2 letters [ta: ta, tha], [ka: ka, kha, ga, gha] what this does is it does not remove your vernacular sounds but with just one letter and more symbols which are merely small and can fit at just one position, say the top, you produce all the letters. In case of Hiragana the whole alphabet has just two symbols a dot and two small strokes. Other symbols are part of the consonants. Then for transliteration you have just ka and ta, anyne who knows what the actual word is then knows howto “accent” it when the trans-version is available. Note that this also means the alphabet system as we know today in India may be missing some sounds available in the past. In-fact manually generated Indian characters were far more beautiful although not modernized. What we have now is an idiotic version without any logical-reduction. This way we also might have lost track of systems and traditions from one place of India to another and have generated 700 languages and what not. [a million statesmen, 33 million Gods] We must go for reduction, in scientific advancement, we are going the opposite way. There ma be a clue to recover the consonants. If my wish permits I will review and see exactly where differences crop up between Hiragana and India-based alphabets. In that article or a related one I had said Dong=east in Chinese is actually quitely and quietly Dokshin Ang = right-hand/right-region/right-organ etc in Indian. [Beijing could be upajing=upastha-anga=upper region, northern region from India-POV. Also this hypothesis does not correspond to a language system-phenomena in present day India but in the whole unspecified region, which is why monosyllables percolated into India from outside or rather there never was a need to have a sanskrut-is-ancient-Indian-language-mother-of-all-language syndrome as is software. 500 years from now “hey microsoft windows was an ancient Indian software”. There was just an unified approach across continents because they had been using the same system developed scientifically over a millenia and gradually due to dislocation etc became different language but retained their inherent nature. Then came the religionists who found it suave and self-gratifying to call one part the mother and the other parts the kids. Thats where enlightenment ends. But lo-and-behold it seems this Dong is present in Japanese system also. The Hiragana of Japanese has series of letters coupled with vowels where depending on which vowel the preceding character is copulated with one calls it by that name. udon [also sounds like udong] edon [edong] are therefore u and e vowel series. [that is they make the preceding character modified like u and e]. This don, dong is also a tong, as d is heavy-tone of t, evidenced by the way Hiragana is formulated, t and d are written by same letter with no symbol to the letter or a small double stroke, again in Indian system this would have been written as two letters for ta and da and a bunch of extra-symbols, if you have the vowel why you need extra symbols? Did the scholars ask themselves? No, they were busy in chanting glorious hymns from Veda, what a perversion. I don’t know when the vowel-syllable system was invented, when was Hiragana formulated, if there are major changes to this system from now before say 300 years and so on. But its clear that the system was in motion since more than a few millenia, as soon as Chinese-Japanese-Asiatic-Indianic systems were in place. How then it escaped present day rules and experts? I think we simply didn’t understand what we were doing since last 300 years or more. We just have a habit of blaming ourselves or others for things that we do not understand, and then there is God who rescues us from every evil including the ones we have inflicted on our selves.